The history of slate mining in the Thuringian Slate Mountains dates back to the 13th century. Since the early 19th century slate is being exploited in the region of Lehesten and Schmiedebach. It is used for roofs, walls and blackboards. The entrepreneur Oertel takes over quarries that are later named after him. In WWII the underground tunnels and halls are used for the war plant Vorwerk Mitte. 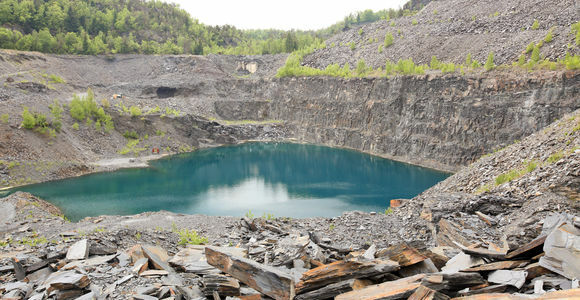 In 1849, Ernst Oertel, a local entrepreneur, acquires the Thomas and Hauptmann quarry. It is later called Oertel I. Around 1865 the Karlsbruch quarry is established (aka Oertel II). In the following years Oertel acquires additional quarries in the vicinity. In 1885/86 the Oertelsbruch quarry is connected to the railway with its own siding. The prerequisites for the distribution of slate improve significantly. In 1890 Oertels’ slate quarries have become the largest slate company in Europe (according to their own estimation). About 900 workers are employed by the company. From 1896 the adjacent area is used as a farm and accommodation for Oertel’s workers. It is later to become subcamp Laura. The large scale farming with more than 100 hectares of acreage and meadows is an important branch of the Oertel company and provides workers and residents with affordable products. In 1906 the company Karl Oertel Schieferbrüche Lehesten G.m.b.H. is founded, which acts as new owner of the Oertelsbruch quarry. The introduction of modern technologies and machinery leads to substantial improvement in slate mining. Additional quarries are bought. During WWI and the following inflation the company runs into financial difficulties. Only in 1925 the slate production reaches its pre-war level. In 1926/27 underground slate mining commences in the north-eastern working area. In 1929 the great barn in the farm area is built. Under the name Block 1 it will later be used as main accommodation for detainees. During the Great Depression the company runs into financial difficulties. It can only be saved from bankruptcy by large loans. After the taking over of power by the NSDAP the slate industry benefits from the booming economy the German Reich. The slate is – among other purposes – used for newly constructed barracks. The Oertel company that had been severly hit by the Great Depression increases its workforce once again. In 1935 the underground mining in the south-western area of the quarry is started. The emerging tunnels and halls are later used and expanded for the war plant. After the German attack on Poland, the company loses the majority of its workforce due to conscription and the dismissal to armament factories. Parts of the technical facilities are also moved. At least since early 1940 the Oertel company uses Polish forced labourers. Early 1942 the company 158 workers are recorded (excluding administration), among them 21 Poles. The company also uses French forced labourers. Following the liberation of the camp by US troops, the quarry is used for the testing of rocket engines under the participation of American experts. Shortly before the area is handed over to the Soviet army parts of the special equipment is dismantled. Several German experts and members of the management abscond to the western occupied zones. In July 1945 the Soviet army takes over the remains of the war plant in Schmiedebach. The Soviet military administration uses the rocket engine test stands in the quarry (named ZW 8 Lehesten). Until spring 1946 a serial of engine tests is carried out on the two old and a third, newly erected, test stand. Temporarily an entire A4 rocket is put together and tested. In April 1946 the dismantling of the underground facilities in the Oertelsbruch quarry starts and is nearly completed in October. On the 24th/25th of October members of the technical personnel and their families are moved to the Soviet Union. Some of them only return nine years later. Most of the remaining staff is laid off in November. Between November 1947 and January 1948 a large number of rocket engines that had been left behind are blasted. In March 1948 the Soviets order the destruction of the armament facilities above- and underground.